Music for special events. 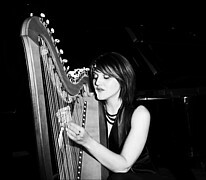 Harp, piano & vocals - book Visnja for your corporate function, conference or special occasion. Cairns, Melbourne, Sydney, Brisbane, Adelaide, Australia wide. 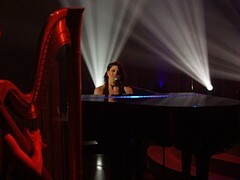 Someone saying "I love the sound of the harp" is often heard in a crowd watching Visnja perform. Whether it is part of a music festival or on stage for a corporate function, there is just something special about this soothing ancient instrument, especially when employed in contemporary music. At the piano, Visnja exudes a deft touch from her classical training and yet her repertoire on both piano and harp draws on inspiring selections from the 1980s through to Coldplay and the alternative songwriting genius of Nick Cave, Kate Bush and Leonard Cohen. To watch Visnja perform her interpretations of such songs, visit the video page on this site. Whether your event calls for three songs, the Australian National Anthem or extended sets, Visnja's pure voice and playing style lend musical magic to conference openings, art exhibitions, product launches, fashion shows and scientific symposia alike, in ways people do not expect, and never forget. Price guide - please make contact for an exact quote. Quotes are inclusive of agent referral fees, as we appreciate their assistance in liaising with clients and sourcing opportunities. $550 for the first hour (1 x 40 minute set) - including sound check within 1 hour of performance. $1500 (2 x 40 minute sets) + airfare + two nights' accommodation OR as negotiated.